Mary Wollstonecraft Godwin (Elle Fanning), 16, lives with her father, William Godwin (Stephen Dillane) and her stepmother, having lost her mother when she was a baby. Although just a teenager, Mary wants very much to be a writer. When she meets married poet Percy Bysshe Shelley (Douglas Booth), the two fall in love and he asks her to run away with him. When they meet with Shelley's friend, Lord Byron (Tom Sturridge), he states he doesn't believe women are intelligent enough to form ideas of their own, so he suggests they have a competition in which they each write their own ghost story. 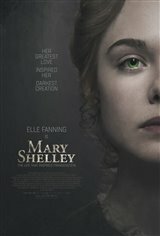 Having seen a demonstration in which it's suggested that the dead can come back to life, Mary gets an idea for what will become her classic novel, Frankenstein.